I don't know how it's possibly been over a week already, but last Sunday we did a bunch of sightseeing in DC. I hadn't been there since I was little, so it was amazing to see all of the sites at the National Mall again as an adult. That Lincoln Memorial...wow. These shorts are not something I would normally pick out, but I loved the pink and wanted lots of fun (and comfy) shorts for our trip. I'm sad that these have sold out, but I still wanted to post them! They were nice and lightweight for the heat that day and I love that they're high-waisted! 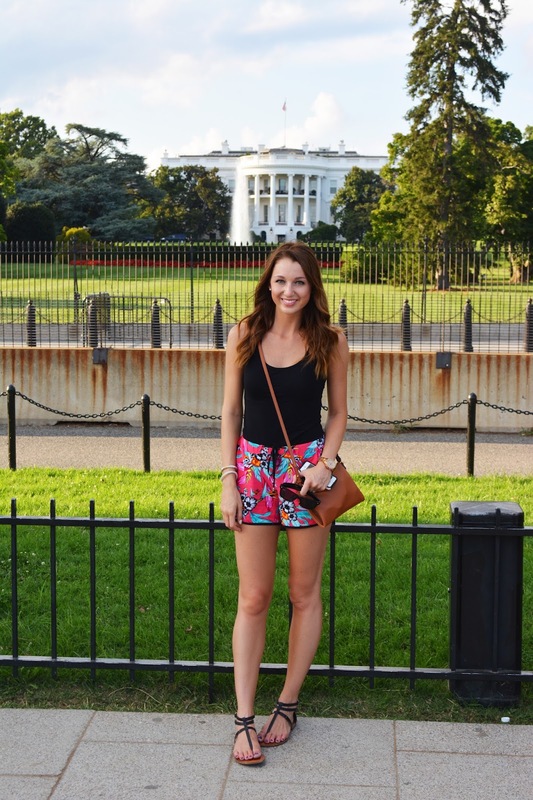 And now I'll leave you all with a dorky tourist photo of me in front of the White House. Oh hey Obamas! I'll be in DC this week so I am even more excited now. You look so precious. Those shorts are super cute. And I love how you styled them. Great outfit. OBSESSED with those shorts–they look so comfy! Stay best and have a beautiful day! These shorts are so fun! It can be so fun to buy something you wouldn't normally wear-- some of my favorite items actually started as "These deviate from my usual style but I think I like them" purchases haha. And the shorts look amazing on you!! Congrats on getting married!! Can't wait to see the pics! I’m a big fan of patterned shorts/pants and these are spot on! Lookin’ good friend!